Poet, playwright, and novelist Rabindranath Tagore (1861-1941) was one of the towering cultural figures of modern India, winning the Nobel Prize for Literature in 1913. Of his many works, the most enduringly popular has been Gitanjali, or Song Offerings, likely due to the honesty with which these verses articulate the poet’s personal, and humanity’s eternal, spiritual quest. 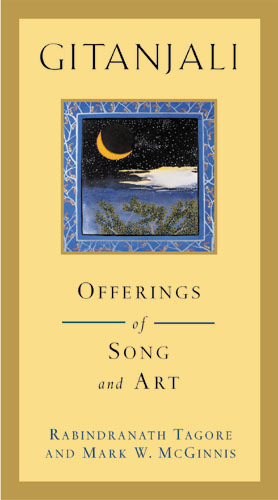 Although steeped in Hindu roots, the poems are universal in their appeal, reflecting an ecumenical passion for and joy in a union with the divine; they have the capability of bringing together compassionate, seeking minds of all faiths. Certainly they are worth reading and rereading in these times of troubling religious strife. When artist Mark W. McGinnis came to read Gitanjali in the summer of 2001, he immediately dropped what he was working on and began a series of paintings inspired by the work. The results are 103 exquisite nine-by-nine-inch paintings, after the fashion of Indian Kangra style paintings of the late 18th century. During the course of the project McGinnis submerged himself in Tagore’s world, reading widely in and studying all areas of the poet’s diverse and creative career. His paintings are intended not simply to be illustrations of Tagore’s verses but images inspired by them and the artist’s understanding of the creative mind behind them. Both songs and paintings are here brought together in a deluxe gift edition, with hand-made Indian endpapers and ribbon marker. It is the artist’s hope that this work will help more people to know the work of one of the great minds of the modern era. Rabindranath Tagore, through his multi-faceted cultural activities, has become for the world the voice of India's spiritual heritage. Mark W. McGinnis is an artist and educator whose interdisciplinary projects have been featured in over 110 solo exhibitions nationwide. His previous publications include Buddhist Animal Wisdom Stories, Lakota and Dakota Animal Wisdom Stories, and Elders of the Benedictines. and thy melodies will break forth in flowers in all my forest groves. There is the lamp but never a flicker of a flame---is such thy fate, my heart? I know not what this is that stirs in me---I know not its meaning. `It was I,' said the prisoner, `who forged this chain very carefully. Lest I forget them they never venture to leave me alone. But day passes by after day and thou art not seen. Men hasten to the King's market. All the buyers and sellers are there. But I have my untimely leave in the middle of the day, in the thick of work. and let the midday bees strike up their lazy hum. and I know not why is this sudden call to what useless inconsequence!